Mercedes-Benz just announced a new app that connects its in-car navigation systems with its customers' iPhones. Mbrace version 2.0 still lets drivers unlock their vehicles and, more importantly, find it in a crowded parking lot while adding location-based personal assistance ranging from entertainment, restaurant, directions, and traffic updates via Mercedes-Benz's Concierge service -- assuming you're are an mbrace PLUS customer. Destination information is then fired off directly to your in-vehicle navigation system to get you there. The updated app also includes enhanced Roadside Assistance that transmits the driver's location whenever a call is initiated. Think OnStar with a posh European accent. MONTVALE, Sept. 2, 2010 – As consumers increasingly turn to mobile devices to manage their lives from wherever they are, Mercedes-Benz USA (MBUSA) has introduced an upgraded version of its mbrace telematics platform that connects the in-car navigation system in its vehicles with drivers' iPhones. Developed by its partner Hughes Telematics, Inc. (HTI), the new mbrace Mobile Application version 2.0 allows Mercedes-Benz customers to take their mbrace services with them when they leave their vehicles. Mercedes-Benz is the first manufacturer to extend connected services in this way. The mbrace Mobile Application version 2.0 builds on the automotive industry's first fully integrated smartphone application which was launched by Mercedes-Benz and HTI in November 2009. That application allows customers to use their phones to unlock their vehicles, locate their vehicles in crowded parking lots, and find nearby or preferred dealers among other services. Version 2.0 includes all of those features and also allows customers to seamlessly access Mercedes-Benz Concierge services while away from the vehicle. The concierge can access the caller's location information to deliver relevant entertainment recommendations, restaurant locations, directions, traffic updates and more. Requested destination information can then be sent directly from the concierge to an in-vehicle navigation system. The new application also allows users to save multiple accounts in the log-in screen and assign nicknames, making it simple and quick to access multiple mbrace accounts from one device. "Version 2.0 of the mbrace Mobile Application takes the convenience and connectivity of mbrace further than ever before, allowing customers to access connected services anywhere, anytime," said Sascha Simon, who heads up advanced product planning for MBUSA. "Imagine you're away from your car talking on your iPhone to Mercedes-Benz Concierge. The agent can provide you with a great restaurant suggestion and simultaneously send the destination both to your iPhone and into your car. That's what makes the system so great: the flexible architecture allows us to continually add new features as mobile technology evolves, keeping us on the cutting edge of innovation and connected services for our customers. This latest mobile application is a perfect example of that, and we will continue to add more features and connectivity on an ongoing basis." 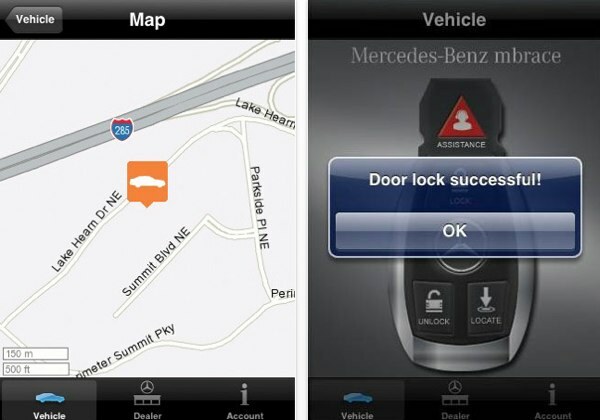 In addition to the new mobile concierge service, Roadside Assistance on the iPhone also has been enhanced with the mbrace Mobile Application version 2.0 so that when a call is initiated, the customer's location information is transmitted to the Mercedes-Benz Roadside Assistance Center, allowing for more efficient and accurate service in the time of need. In instances when the vehicle may not be accessible, may not have power, or is in an unknown location, the mobile application allows Mercedes-Benz to help their customers by pinpointing exactly where to send assistance. As the first automaker to offer a mobile application truly integrated with the vehicle, MBUSA continues to be an industry leader in bringing new connected technology to market. For customers on-the-go, the mbrace Mobile Application provides simple and seamless connectivity to the ever-expanding set of Mercedes-Benz mbrace services. "Mercedes-Benz mbrace was designed as a platform for continuous innovation," said Erik Goldman, president, HTI. "The release of mbrace Mobile Application version 2.0 extends new services beyond the vehicle, giving Mercedes-Benz customers the freedom to seamlessly enjoy personalized service even when they're not in the driver's seat. We look forward to working with Mercedes to continue expansion of the mbrace Mobile Application service and feature set, enabling enhanced connectivity and interaction between the mobile device and vehicle."